GRAND RAPIDS, MI – Bill Melvin has raced and ridden motorcycles since he was four years old. Now the 38-year-old CEO of Grand Rapids-based Liquid Asset Partners is in a position to build and sell one of the industry's most iconic brands. Liquid Asset Partners is the new owner of Erik Buell Racing (EBR), a high performance motorcycle company operating in the shadow of industry leader Harley-Davidson Motorcycle Co. in Milwaukee, Wis.
Melvin acquired EBR for $2 million last week in an auction at Walworth County Circuit Court after the company ceased operations and went into receivership in April 2015. While Liquid Asset Partners is best known for liquidating and selling off assets that fall into receivership or bankruptcy, Melvin said he wants to breathe new life into the company, which once employed 130 in the Milwaukee suburb of East Troy. 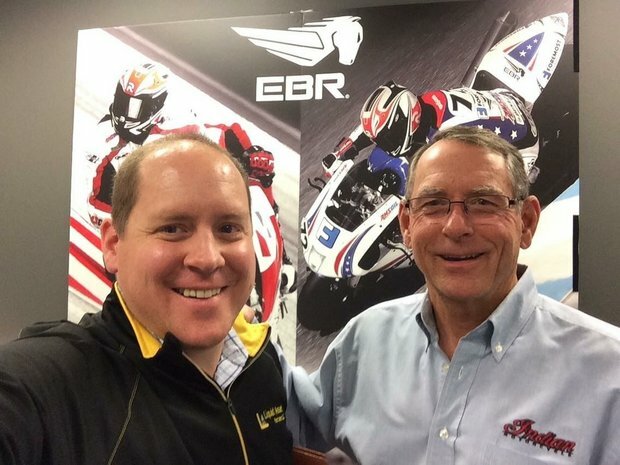 Melvin said he hopes to find a new buyer "who has the proper experience, financial ability and desire to continue manufacturing EBR's motorcycles for many years to come." Part of the plan may include selling off assets to streamline company operations. "Maybe it will be crowd sourced, maybe a private investor will step in, maybe we will provide financing for the right team to move forward, or maybe a large manufacturer will acquire the brand with additional due diligence," Melvin said in a Jan. 15 press release announcing his acquisition. "Our hope is that someone will continue to manufacture these amazing motorcycles and with our acquisition we are adding more pavement to the road so that can happen," he said. "I believe Erik Buell Racing (EBR) has established themselves as one of the premier motorcycle manufacturers in the world and has strong potential as a viable business," said Melvin, who said his personal collection of motorcycles includes a Buell. "Hundreds of millions of dollars have been spent on research and design to arrive at the EBR RS, RX, and SX platforms, which have proven themselves on the racing circuit to be state of the art and in dealer sales to be in high demand," said Melvin. "Their bikes, out of the box, can go head to head with the top Italian race bikes," Melvin said. "Our sale process will enable the proper exposure of the company and price flexibility that may better fit a new owner to move forward with operations." Melvin said he hopes to involve the employees of the company, which was founded by legendary motorcycle racer Erik Buell after Harley-Davidson ceased operations of the Buell Motorcycle Co. in 2009. During its six-year history, EBR hand-built $40,000 motorcycles for racing enthusiasts and developed a street version that sold for about $18,000 each, according to the Milwaukee Journal-Sentinel. Melvin and his father, company chairman Bill Melvin Sr., are familiar with the motorcycle industry. Their 42-year-old company was involved in the sale process of the Cannondale Motorcycle factory in 2002, the Indian Motorcycle factory in 2004, the American Ironhorse Motorcycle factory in 2009, the Buell factory in 2010, and has assisted in the sale of major distributors, dealers, and suppliers.